I recently attended a street-photography workshop at TCDC here in Bangkok with David Gibson and Richard Bram (In Public). At the end of the workshop we went through a critique of 40x students work, 10x photos each. From these, a show will be curated by both Gibson and Bram titled, “Bangkok Now”. I most definitely enjoyed myself and while stylistically at odds with the focus of this particular workshop (juxtapositions & the surreal), it’s definitely highlighted the fact that I’m not shooting enough. Editing from a batch of 100 is a far cry from a batch of 1000. And with the small insight to their process, the volume of shooting is significant. Perhaps not mind-blowing but a reinforcement of solid practice and commitment to the craft. The image below is probably the most successful one of the weekend of my work or at least the one that garnered the most attention. I like it but I can do better as there are still things to resolve formally within the frame. The exhibition presents the selected works from the 3-day “Bangkok: Street Photography Workshop” during 1-3 February 2013, a shooting experience along with feedback and advice from iN-PUBLiC’s key members David Gibson and Richard Bram, jointly presented by TCDC and the British Council. “iN-PUBLiC” is a group of 21 acclaimed photographers working in streets and public places around the world. The collective was formed by Nick Turpin in 2000, to gather together a community of street photographers – to create a ‘home’ – but above all else to celebrate street photography. The photographs from its twenty-one members worldwide showcase the vitality and normality of street photography. 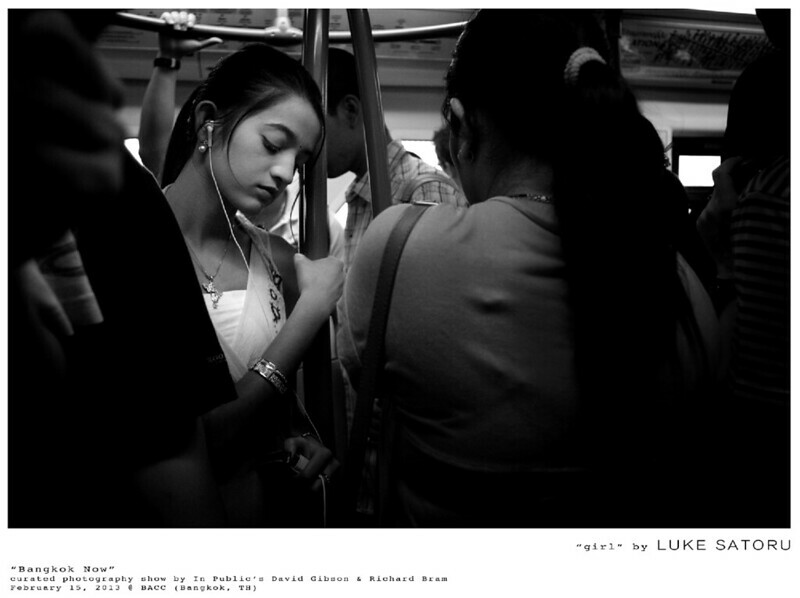 See the unusual in the everyday through the eyes of the iN-PUBLiC photographers with “iN-PUBLiC: An Exhibition of Street Photography” from the UK, in Thailand for the first time from 5 February – 24 March 2013 at TCDC.